One of the most vivid childhood memories is sitting in my parish church, gazing up at a large fresco of the Child Jesus and St Josephworking in their carpentry shop. I wondered what the pair discussed amid the rasping of their tools and fragrant wood shavings. My childish faith imagination helped me forge a deep bond with the young Jesus and St. Joseph which has never left me. The same bond is recreated in Francis Woke Up Early (Gingerbread House Books). No saint outside of the Bible is as widely known as St. Francis of Assisi, yet he can be little more than a garden statue in children’s minds. Francis Woke Up Early gives children a chance to enter into a day in the life of the child Francis. This is not a biography; it’s a meditation on the character of the boy who became a saint. 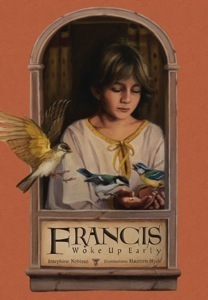 Francis woke up Early helps children see that all saints began life like they, seeking outdoor adventures, and loving their family, yet, his future spiritual greatness is foreshadowed in this enchanting book. What is best known about Francis is his bond with animals, particularly his sermon to the birds and his befriending the fierce wolf of Gubbio. Using these events as inspiration, author Josephine Nobisso paints a charming yet thoughtful portrait of the young saint. Imagine a sunny morning, which awakened Francis at dawn, and coaxed him to venture outdoors past a sleeping household in search of a breakfast of goat’s milk, all frothy and warm. Dramatic storytelling paired with brilliant illustrations fires imaginations both young and old, and will lead to many a discussion of the life of St. Francis. Each painting is a work of art worthy of framing; these captivating paintings of Assisi were completed over a period of twenty years by artist Maureen Hyde who provided the idea for the story. Francis Woke up Early will become a family favorite, and would be a delightful Christmas gift for preschool through third grade children. Leticia Velasquez is a wife and homeschooling mother of three daughters. Leticia is a freelance writer whose articles have appeared in Faith and Family magazine, a columnist for Celebrate Life magazine, and blogger at Cause of Our Joy and at Catholic Media Review. She is the editor of A Special Mother is Born: Parents Share How God Called Them to the Extraordinary Vocation of Parenting a Special Needs Child. You Don’t Have to Be a Superhero Just Because You Have Down Syndrome!